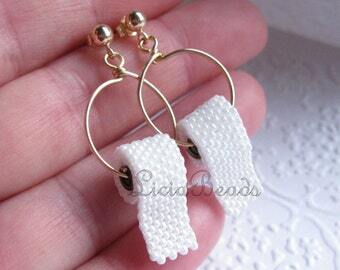 Toilet Paper earrings with gold plated stud post earrings. Announcement Toilet Paper jewelry from the original artist, established in 2007. Each are hand woven from tiny seed beads. 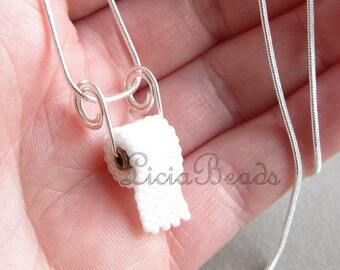 LiciaBeads is a licensed tax-paying business, established in 1990. The beaded TP rolls are copyrighted, all rights reserved. Thank you for your support! 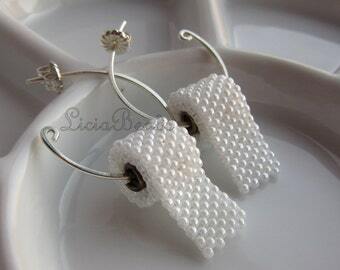 Toilet Paper jewelry from the original artist, established in 2007. Each are hand woven from tiny seed beads. 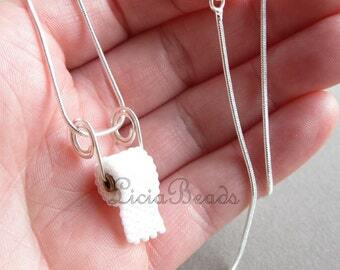 LiciaBeads is a licensed tax-paying business, established in 1990. The beaded TP rolls are copyrighted, all rights reserved. Thank you for your support! Great ship time. Love the earrings! 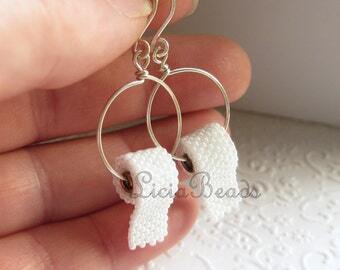 I love my toilet paper earrings! Cute, funny, and incredibly well-made. Thank you! It seems that most people find my shop via the TP jewelry. Created on a whim in 2007, they have been on a roll since! Caught up in a world of beadcraft and creating a range of designs from everyday, to bridal sets and flirting with the border between fun and strange. LiciaBeads began in 1990, over a quarter century ago as I entered high school. I've been beading ever since then and love being able to offer my work across the globe using online resources. I offer a wide range of jewelry but since becoming a full time parent and part time business owner my capacity has limited to the most popular work. I am always happy to entertain custom orders if you don't mind waiting for creation. The toilet paper jewelry started rolling out in 2007 exclusively on Etsy. In 2012 while pregnant with my first boy I received a message from Readers Digest that they wanted to add a little photo of my work to one of their humor sections. Shortly after the baby was born that photo made it's way to The Tonight Show and I was inundated with orders and business. Since then they have been featured in various humor blogs and websites and on Facebook which bring in regular and sometimes excessive orders. I appreciate everyone's support and sharing and referrals! All my TP rolls over the top to the front.... unless requested otherwise. Creating handmade jewelry since 1990 and delighted to operate my own businesses to help support my family and advance my beading passion. Happily living a more sustainable lifestyle while working from home in the beautiful Pacific Northwest. Thank you for your support of my full time compulsion! As always, I try my best to represent my work as accurately as possible, but colors may vary depending on your monitor. Please take note of measurements carefully and let me know prior to purchase if you have any requests or concerns. A small printout invoice is included with your orders, please let me know if it should be omitted for gifting purposes. If you are not satisfied with your purchase please contact me ASAP. I request returns be postmarked within 7 days of receipt. I will gladly refund your money less shipping charges upon return of the item in its original condition and packaging. CUSTOM ORDERS are generally non refundable, but please let me know if you are unhappy with the outcome so that I may do what I can to make sure that you are pleased. I take care to communicate and photograph all details to be sure your are satisfied with the order before making the final purchase. Custom order deposits are not refundable once the details have been agreed to and orders are in progress. Please let me know as soon as possible if there are any concerns. Payments are securely processed via Etsy checkout or PayPal depending on your payment choice. Your information is kept private from sellers for your consideration and security. Merchandise will be shipped using USPS first class mail (or Priority mail if postage paid/size allowances are needed for larger orders) unless discussed otherwise. Tracking information for domestic orders will be sent to you via e-mail and can be accessed via your Etsy account. Custom orders will ship according to their completion as discussed via private conversation. Made to order items will ship upon completion no later than the lead time stated in the listings. International orders may be limited depending on your countries customs regulations regarding import of some materials and my confidence in their safe arrival. I do everything in my control to send your item promptly and well packed so that it arrives in good condition. Please check with your countries customs rules if you are concerned about possible fees associated with the import of your item. I am legally required to accurately represent the contents and value of packages, no exceptions. Buyer is responsible for any tariffs. will require a phone number to ship. Please leave the information in the notes to seller. I will contact you for either a change of address or phone number if it is missing. I will check the customs restrictions of countries before shipping and add countries that do not prohibit importation of my items. If your country is not listed, please let me know. Thank you for your time and efforts regarding this. Please note that RESIDENTS OF WASHINGTON STATE will be charged sales tax through pay pal. The proper adjustments for Washington destination based sales tax will be made based on the shipping destination of your purchase.